One of the greatest parts of summer is being able to cook outside and letting your kitchen stay cool. But when you want a pizza or a nice batch of cookies you’ve got to bit the bullet and just turn on the oven, right? 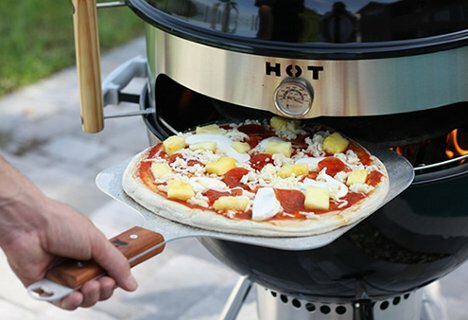 Not so now that some visionary genius has thought of KettlePizza, an attachment that turns your plain old kettle grill into an awesome outdoor pizza oven. 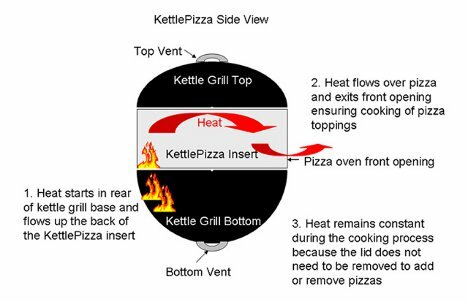 KettlePizza is so simple that it really is hard to understand how it hasn’t been invented before. It consists of an insert that fits between the body and lid of the kettle grill. 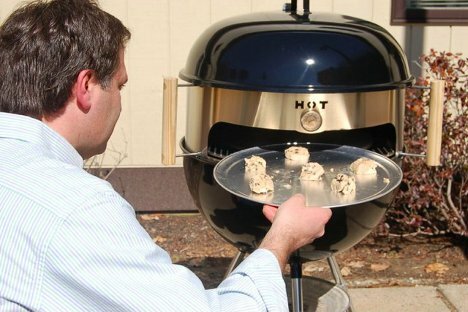 It works with just about any kind of kettle grill. A hole in the insert gives room to slide a pizza or baking pan in without having to lift the lid. That’s the secret to turning your grill into an oven: the constant, uninterrupted heat that circles around the food to cook it. The end result is fancy-pants wood-fired pizza just like those expensive restaurants make, but way cheaper. Plus you can make it while wearing your Bermuda shorts and “Kiss the Cook” apron, a uniform that probably wouldn’t fly when you go out to eat in a restaurant.